Seventy years ago, on January 2nd, 1833, at the Sarov Hermitage, there departed peacefully to the Lord the blessed elder Hieromonk Seraphim, who by his exalted, truly Christian, ascetic life acquired love for himself and faith in the active power of his holy prayers from his contemporaries even during his lifetime, and after his blessed repose, the memory of him, confirmed by ever more frequent signs of the mercy of God, manifested through faith in his prayerful intercession before God for those who have recourse to him, is spreading far and wide among the Russian Orthodox people and is honored by them with profound reverence. His whole life is comprised of highly edifying examples of truly Christian asceticism, ardent faith in God, and self-denying love for his neighbors. While yet a youth, he left his parent’s home in the city of Kursk and, unbeknownst to anyone, entered the Monastery of Sarov. There he began his life with the first degrees of obedience, and humbly passed through them, winning from all love for himself and respect for his meekness and humility. In eight years he passed through the preliminary test of his readiness to enter upon the path of the monastic life, and on August 18, 1786, he received the monastic tonsure and the new name Seraphim. Two months later, he was ordained to the rank of hierodeacon. Fortified by humility, Father Seraphim mounted from glory to glory in the spiritual life. As a hierodeacon, he spent all his days, from morning to evening, in the monastery, celebrating the services, observing the monastic rule and performing obediences, and in the evening he withdrew to a hermit’s cell, spending the nighttime there in prayer. Early in the morning, he would again appear in the monastery to carry out his duties. 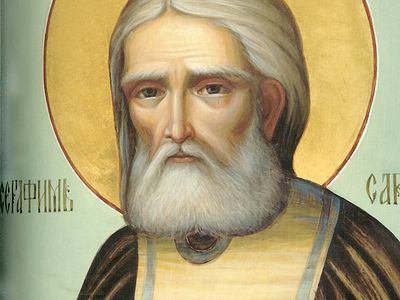 On September 2, 1793, he was ordained to the rank of hieromonk, and with exceptional zeal and intense love he continued to struggle in the spiritual life. Yet prayers, fasting, obedience, poverty, the toil of the monastic life, which for others is difficult in and of itself, were no longer enough for him. There was within him a thirst for ever more intense struggles. He left the monastic community and withdrew, to undertake these struggles, to a lonely hermit’s cell in the dense pine forests. Fifteen years he spent there in perfect solitude, fasting strictly and constantly exercising himself in prayer, the reading of the Word of God and bodily labors. Imitating the ancient stylite saints, deriving strength and comfort from the help of grace, he spent a thousand days and nights standing on a rock, lifting up his hands to Heaven, repeating the prayer: “O God, be merciful to me, a sinner!” When he was finished with his hermit’s life, he again went to the Monastery of Sarov, and there, as in a tomb, he enclosed himself in reclusion for fifteen years, for the first five of which he imposed upon himself a vow of silence. Filled wholly with the radiance of the Holy Spirit through the constant elevation of his mind and heart in prayer to God, he was repeatedly deemed worthy of visions from the world beyond. Spiritual joy imbued the elder to such an extent that they never saw him sad or despondent, and this joyful state of his spirit he strove to impart also to others. Of the Christian virtues he was most of all adorned with meekness and innocence, extreme humility and a lack of acquisitiveness. Having completed his earthly sojourn, pure of soul, humble and full of love, the elder peacefully, serenely fell asleep in the Lord, kneeling before the Tenderness Icon of the Mother of God, his head bowed, his hands folded upon his breast. After his blessed repose in the Lord, memory of his exalted ascetic life not only did not fade, but gradually grew and became established among all classes of the Orthodox people of Russia. 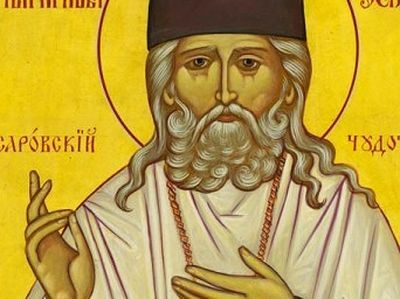 In the depth of its heart, the Orthodox nation honors the blessed elder as a true favorite of God, and believes that in his intercession before the Lord, even after his departure from this world, he does not forsake all who have recourse to him. And the Lord God, Who is wondrous and glorious in His saints, has been well-pleased to manifest many wondrous signs and healings through the intercession of Father Seraphim. Sharing fully the faith of the people in the holiness of the ever-memorable Elder Seraphim, the Holy Synod has repeatedly acknowledged that it is must issue the necessary decrees for the glorification of the righteous elder. In 1895, His Grace, the Bishop of Tambov submitted to the Holy Synod the report of a special commission investigating the miraculous signs and healings wrought through the prayers of Father Seraphim for those who asked his aid with faith. This investigation, begun by the commission on February 3, 1892, was concluded in August of 1894, and was conducted in twenty-nine dioceses of European Russia and Siberia. Ninety-four instances of the gracious aid received through the prayers of the Elder Seraphim were investigated by the commission, the majority of which were fully confirmed by the necessary affidavits of witnesses. Yet this number of cases of gracious aid obtained through the prayers of the elder far from corresponds to their actual number: In the archives of the Monastery of Sarov, according to the testimony of the above-mentioned commission, are preserved hundreds of letters from various persons, reporting on the benefactions they have received in turning to the Elder Seraphim in prayer. Since these statements were not only not investigated, but were nowhere registered, the Holy Synod asked His Grace, the Bishop of Tambov, to direct the abbot of the Sarov Hermitage to collect and record accounts of the more remarkable cases of gracious aid through the prayers of the Elder (those which had not hitherto been recorded), and to keep a careful record of any new miraculous signs wrought through the prayers of Father Seraphim in the future. After this, His Grace, the Bishop of Tambov, twice, at the beginning and the end of the year 1897, presented to the Holy Synod collections of copies of the written statements of various persons concerning miraculous signs and healings wrought through the prayers of Father Seraphim. Still not finding it timely then, on the occasion of the aforementioned petitions of His Grace, the Bishop of Tambov, to enter into final discussions on the glorification of the ascetic of Sarov, the Holy Synod reiterated that the abbot of Sarov Hermitage was to continue to record as many new miraculous signs as might be worked through the prayers of the elder. This past year, 1902, on July 19, the date of the elder Seraphim’s birth, His Imperial Majesty was pleased to take note of both the prayerful struggles of the departed one and the universal ardor of the people for his memory, and to express the desire that the work already begun by the Holy Synod toward the glorification of the revered elder might be brought to a conclusion. Having reviewed the circumstances of this important case in great detail and with all possible care, the Holy Synod has found that the multitude of cases of the gracious help received through the prayers of the elder Seraphim, which have been investigated in an appropriate manner, do not allow any doubt whatever as to their validity, and in their nature belong among the events which manifest the miraculous power of God, which is being poured forth, through the mediation and aid of Father Seraphim, upon those who with faith and prayer have recourse in their spiritual and bodily infirmities to his gracious intercession. 3) To have the Holy Synod announce this to all the people. 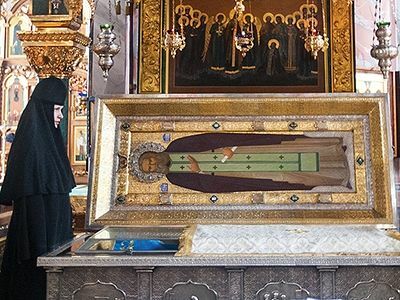 Attached to this report were submitted for the monarch’s discretion the original report on the examination of the most precious remains of Father Seraphim and a brief account of instances of his miraculous assistance of those who had recourse to his aid. To the humble report of the Holy Synod on this, the Sovereign Emperor, on January 26 of this year, deigned to write in his own hand: “I have read [this] with a sense of true joy and profound compunction. Hearing these most merciful words, the Holy Synod, by a decision dated January 29, 1903, resolved to order His Grace, Metropolitan Anthony of St. Petersburg and Ladoga, together with Their Graces, [the Bishops] of Tambov and Nizhegorod, to perform, on July 19 of this year, the solemn uncovering of the relics of the venerable Father Seraphim, wonder-worker of Sarov. The Holy Synod proclaims this to the pious children of the Orthodox Church, that they may render glory and thanksgiving to the Lord Whose good pleasure this has been, and that they may receive this revelation of a new helper and wonder-worker as a new blessing from Heaven upon the reign of our most august monarch, who undertakes tireless labors for the good of the Orthodox nation of Russia, and in his royal love and care embraces all his faithful subjects of every calling and station.